Mark .l Knapp (born on July 12th, 1938) is a renowned teaching professor at the University of Texas and is greatly known for his works in nonverbal communication research and in evolving interactions. He developed a theoretical model for relational enhancement which routes the interpersonal development between two people. 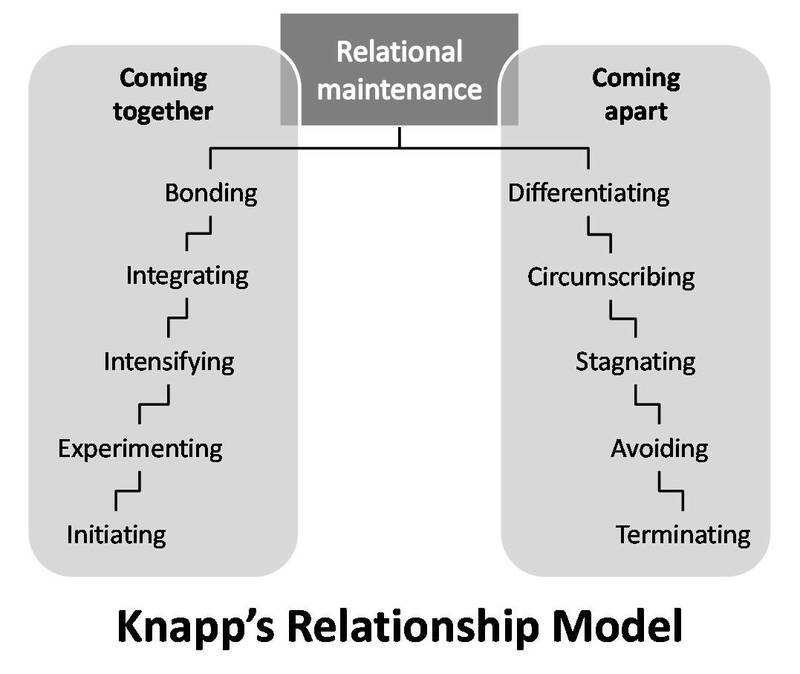 Knapp’s relationship model explains how relationships grow and last and also how they end. This model is categorized into ten different stages which come under two interrelating stages are Knapp’s relationship escalation model and Knapp’s relationship termination model. This helps to understand how a relationship progresses and deteriorates. Diverse levels of speed and altered time between each step can be seen and experienced when a relationship grows. The steps can be even skipped out while the progression or deterioration of a relationship. I. Initiation – This very short stage is all about making an impression. So this stage the judging would not be accurate. People will be concerned with making favorable impressions. The physical appearance plays a great role in impression making such as the dress that they wear, the perfume they use and the overall appearance. Example 1 – If a boy finds a girl attractive and want to make a conversation with her, he will introduce him selves with a formal greeting – how are you? What is your name? Example 2 – In business relationships overall amiability is essential. They ask about demographics, professions and other shared aims. It is important in business to create a good impression at the initial stage itself. II.Experimentation – In this stage, it’s all about exploring to know each other well. Experimentation is also called as the probing stage because each person will analyze the other for information or a common interest so that they can decide whether to maintain a relationship among them. Most of the relationships wind up here due to the different interest levels. Example 1 – When the boy sees the girl the next time they will discuss to find out about their common interest and asks questions like- which is your favorite food? Or which is your favorite car? Example 2 – An exploration into what partner fabricates will add benefit to the business of another person in business relationships. III. Intensifying – In this stage the relationship intensifies and becomes less formal. People will start revealing their personal information and will analyze the impression on the other person. They find various ways to nurture a relationship in order to strengthen interpersonal development such as gifts, spending more time together, asking for dates, expecting a relationship commitment etc. Example 1 – The boy asks the girl for a date. During their date they talk about their lives and how the boy got the job and his personal experience and the girl also reveals about her parents, her previous experiences, etc. Example 2 – In this stage in business, negotiation and commitment activity may be involved which leads to an increase in amount formation and trade. IV. Integration – At this stage, the people will start to make their relationship as much closer than before.In personal life people may fall in love or find a close friend. The level of intimacy can progress to a further relationship. Example 1 – After several months they labeled their relationship as boyfriend and girlfriend. Example 2 – In this stage in business relationships they will start getting profit for their agreement which results in financial benefit. V. Bonding – In this stage, a person will announce to the world about their relationship. They make their relationship recognized and will honor their commitment legally. The relationship is indefinite and only to be broken through a formal notice, agreements or death etc. Example 1 – The boy proposes and the girl agrees to marry him. Example 2 – The bonding stage of business relationships comprises of partnerships and durable relationships which can lower business expenses and can result in more profit. When a relationship progresses, there will be misunderstandings and conflicts and the so called ‘indefinite relationship’ might fail to persist. Like coming together, there are five stages in coming apart. I. Differentiating – When people progress in a relationship they sometimes due to other external pressures will start thinking individually rather than with the partner. They may start developing hobbies or other endeavors. The relationship will start to fade and the everlasting bond will be broken. The feeling of dislike is often expressed by the partners on their commitment. Example 1 – The boy comes up with idea of quitting the job and to do something he wanted. The girl rejects the idea with some reasoning. So a pressure is created inside the relationship. Example 2 – In business, meetings are crucial to know the partners stands and other opinions. Due to work pressure, dealers and other costumers, the meetings are reduced. They start to think more as individuals than as partners. II. Circumscribing – After differentiating partners will limit their conversations and will set up boundaries in their communication. Often people will never communicate the topic fearing an argument. They will have their own personal space and activities. Example 1 – The girl started talking more about the general topics like the food, climate etc. and started avoiding the conversation on quitting the job. The boy does the same. Example 2 – In business, the issues regarding the quality might arise due to the communication gap and the conflicts can lead to alternative contract units. III. Stagnation – The relationship will decline even more if it reaches the stagnation stage. The communication will be more limited. The only reason the partners don’t separate is due to children or other unavoidable reasons. Mostly the relationships in this stage will not continue or improve. Example 1 – As the girl found that there is not much to talk about in general and will remain silent even though they live in the same house. So there is a serious communication gap between the girl and the boy. Example 2 – In business relationships, there will be a communication gap when one party or both the partners feel neglected or when they felt insignificant. IV. Avoidance – At this stage, the partners intentionally avoid any contacts and they will be physically detached. They restrict themselves from any forms of communication to avoid a conversation or an argument. Example 1 – One day the boy packs his bags and walks out of the house. By the time the girl would have completely avoided the boy and will not attempt to stop him. Example 2 – The stagnation stage will result in both partners to avoid each other as it affects their fundamental functioning. V. Terminating – This is the final stage of coming apart. The relationship completely terminates. The partners will take different paths and will go on with their lives. The termination is not just a subjective decision as a divorce but it can occur naturally when the people who were living next door move out or when roommates change as the year ends. Example 1 – The boy approaches an advocate for a divorce. Example 2 – In termination stage the partnership is broken and will go on with their ventures. Thank you for posting this information. It was more helpful than what was in my textbook. I hope you can post more information like this in the future. Thank you so much, it’s Useful information. this really help me a lot of homework! This is a very interesting take on how people get together and how they get dis-enfranchised or get un-tied in relationships. This is something that I can definitely use in all of my relationships whether business or personal. I find that, any of this steps are beneficial to be aware of. In the Knapp’s Relationship Escalation Model, I would correlate it to the Business Etiquette Quality(BEQ). I have tried hard to find a theory that can fit into this concept. It will be more helpful if further advise is given to fill the gap. Very Interesting, practically experimentable, in Customer Relationship management. Thank You very much. This is great! Finally splendid info I was looking for! Straight-forward and interesting info. First of all, many thanks for the article! I wanted to ask if I could use your figure “Knapp’s Relationship Escalation Model” from this article in a journal article I am currently working on about romantic relationships on Facebook? This is bs. Based on a patriarchal slave/master system. Psh. Texas University. Renowned. i used this to write a paper in my interpersonal communications class. it was very helpful!